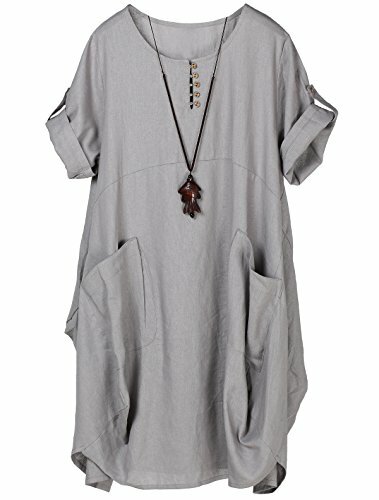 This cloth is 2018 new women's plus size dress, irregular hem design, solid color, front button decoration Loose Swing Midi Dress/Blouse/Tops/Tunic makes you more attractive, charming, fashion and elegant. Size M: Bust:118cm//46.4", Shoulder:42cm//16.5", Sleeve:27cm///10.6", Length:94cm//37"
Size L: Bust:124cm//48.8", Shoulder:44cm//17.3", Sleeve:28cm///11", Length:96cm//37.7"
Size XL: Bust:130cm//51.1", Shoulder:46cm//18.1", Sleeve:29cm///11.4", Length:98cm//38.5"
Size 2XL: Bust:136cm//53.5", Shoulder:48cm//18.8", Sleeve:30cm///11.8", Length:100cm//39.3"
Occasion: Casual, Holiday, Vocation, Evening, Party, School, Homing, Daily. Search Minibee for more products. Welcome to the order. Thank you. Nice for casual daily wear, relaxed holiday, dating, wedding, party, beach, vocation and any other occasion. If you have any questions about this product by Minibee, contact us by completing and submitting the form below. If you are looking for a specif part number, please include it with your message.